With a 1920x1080 IPS Alpha panel, picture quality is excellent, and there is a very wide viewing angle. 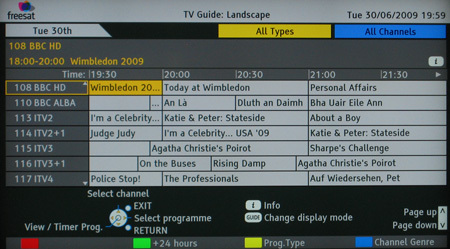 The BBC HD channel looks amazing, and SD channels didn’t fare too badly on the whole, both using the built in tuners and with component interfacing from a Freeview PVR. Panasonic makes much of its 100Hz intelligent frame technology, and it certainly seems to smooth out the jerkiness of scrolling text or sideways camera movements. We’re less convinced by the Dynamic picture mode, which seemed to over-saturate the colours. An Eco setting adjusts to ambient lighting, and seems to do so without too much interference with the picture quality. Contrast is excellent, with deep blacks that look convincing, with plenty of detail still visible in shadowed areas. The set coped very well with extremes, such as explosions, in a range of test content. Most settings stay with the particular input, so you can have overscanning turned on for an SD source, for instance, and off for your Blu-ray player. Sound is reasonable, but not excellent. There are preset choices for speech and music, as well as adjustments for bass, treble and balance, together with an option to say how far the set is from the wall. You can also adjust the relative volume for each channel or input, which is a good touch. Less successful are some of the ‘surround’ modes. ‘V-Audio ProSurround’ adds reverb that just sounded nasty to us, though the other modes do make the soundstage appear wider. You’ll better off, using the digital or phono outputs to feed a signal to your HiFi – slimline sets are never going to deliver a truly satisfying bass. 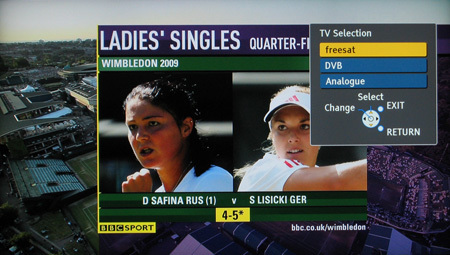 Unlike other Freesat sets, the Ethernet port’s not restricted just to the forthcoming iPlayer, which is due to be available from the ‘red button’ interactive services this autumn. Panasonic’s own VieraCast service provides weather, market information from Bloomberg, plus access to Picasa and YouTube. There are sports clips from Eurosport too, and German news from Tageschau.